﻿ Hotel Maranello Village Maranello. JIMAT di Agoda.com! Maranello Villlage menawarkan barang niaga Ferrari yang rasmi dan maklumat mengenai muzium Galleria Ferrari yang berdekatan. Ia menawarkan bilik-bilik moden dengan akses Wi-Fi percuma. Hotel 4-bintang ini terletak di kaki gunung Apennines. Ianya dikelilingi oleh tumbuh-tumbuhan hijau dan mempunyai halaman dalaman serta lorong basikal. Di Maranello Village anda akan menemui kawasan untuk bersantai. Terdapat restoran piza dan restoran à la carte yang eksklusif dengan lebih daripada 150 wain yang berlainan. Kafe Stop & Go dibuka untuk sarapan pagi, dan pada hari isnin hingga jumaat, ia juga dibuka untuk minuman sebelum makan malam. excellent apart form very cold and humid room. the weather just changed and the heating element was off (early may 2014). problem solved with extra blanket thanks to accommodating staff. looking forward to coming back again! we enjoyed our stay at the hotel with the first impression as wow of the bright red colour exterior of the hotel resembling the race track of the ferrari town. 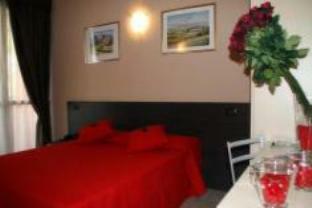 the room we had was a family suite with a kitchen and living room which was spacious for a family type. breakfast was at additional charge but was continental and acceptable. booked the hotel based on availability and was plesantly surprised by what i found on arrival. close to the ferrari factory, ferrari store and ferrari museum this hotel is all ferrari with an exceptional foyer and well themed throughout. 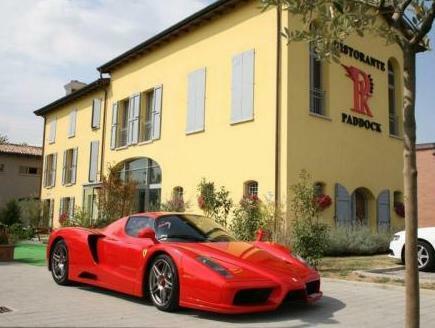 an ideal place to stay whilst at maranello. 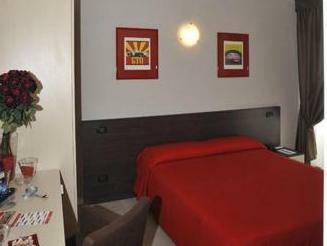 probably the best place to stay if you are in maranello to absorb all that is ferrari. wir waren da, weil meine frau unbedingt das ferrari museum während unserer rundreise sehen wollte. Achtung, das hotel liegt ausserhalb von Maranello. Wir haben eine weile gesucht. gute, grosse zimmer, freundlicher empfang. eine restaurantempfehlung des rezeptionisten hat sich als das beste italienische restaurant, in dem wir je gegessen haben herausgestellt. Unglaublich!!! Il pasticchino. Hingehen!! aber reservieren. il WiFi non funzionava da qualche giorno. A volte WiFi è importante per gli ospiti. Avrebbero dovuto ripristinare più rapidamente. hôtel parfait avec ambiance ferrari, petit déjeuner copieux et de bonne qualité. hotel rewelacyjnie polozony w poblizu fabryki ferrari. swoim wygladem nawiazuje do motoryzacji oraz wyscigow samochodowych. w recepcji znajduje sie bolid f1. hotel jest zadbany i czysty. pokoje nie sa jakosci 4 gwazdkowego hotelu. bufet sniadaniowy jest ok. obsluga jest dosc powolna i zapomnieli oddac dokumentowy przy wymeldowaniu,wiec trzeba sie pilnowac i miec na wsyzstko oko. obok hotelu jest bardzo dobra restauracja.